Little Folded Hands. 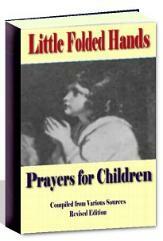 Prayers For Children. Page 1. Guard me through the daytime. From the narrow way. Amen. Keep my hands from doing wrong. Keep me ever Thy dear child. Amen. Now and through eternity. Amen. Help me a Christlike child to be. Amen. Of quiet sleep and rest. Thy holy name be blest. Amen. And what Thou willest, be. Amen. To-day and every day. Amen. with me, that the wicked Foe may have no power over me. Amen. Bless me, and remember me. Amen. And those whom I love. Please Pay Us Both a Visit.